This is a major success in the Finzi and Naxos stakes. The company's British music series has been extremely successful and this issue only serves to consolidate that reputation. 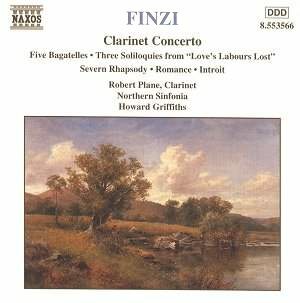 It also ideally fills a gap in the Finzi catalogue: a bargain price collection of good/excellent Finzi orchestral pieces built around the clarinet concerto. I discovered Finzi through the pristine and so far unmatched beauty of the EMI Wilfred Brown version of Dies Natalis which was conducted by Christopher (Kiffer) Finzi (yes, the same one supposedly depicted in the film 'Hilary and Jackie'). I rather regret that he did not record other Finzi works. What I wouldn't give to hear Kiffer Finzi conduct Intimations of Immortality with Wilfred Brown singing! It was not through the vocal works that Finzi's music came to enjoy a revival in the early 1970s. It took off with the devil-may-care charm and vernal freshness of the clarinet concerto. This was written for Frederick Thurston whose widow, Thea King, ushered in its return to the repertoire, at first with various BBC studio orchestras such as the BBC Training Orchestra and the Academy of the BBC, ensembles now long gone. Gradually it came into concerts with the BBC regional orchestras in Wales and Scotland and ultimately featured in foreign tours by the BBCSO. Various soloists took it up and it soon became a standard bearer for the British musical renaissance. It was also chosen by various competitors in the BBC Young Musician of the Year competition. There have been quite a few recordings but apart from a roughness in the strings at the start the present account by Robert Plane ranks with the best. For the record the work comes over best of all in the big strings sound given to it in the as yet unreissued Lyrita LP (John Denman with LSO/Vernon Handley). For those who are drawn to Finzi you soon realise how little he wrote. If you lament the absence of a second clarinet concerto Lawrence Ashmore's orchestration of the familiar Five Bagatelles (originally for clarinet and piano and often featured in AEB exam setpiece lists). This is not its premiere. That came on an old and now deleted RCA with the clarinetist Robert Stoltzman. These are delectably done by Plane and the orchestra. Try the lovely sense of natural pacing in Forlana (track 7). The Three Soliloquies are also well done and can be compared with the Boult/LPO Lyrita LP (no CD yet). Griffiths's smaller forces lend this version and predictable but still compelling intimacy. They are however very slight pieces and the complete suite from Love's Labours Lost is much to be preferred on a Nimbus CD. Severn Rhapsody and Introit have little or no competition and both are winsome works from the early years. The Rhapsody is not a summer's breeze away from Butterworth's Shropshire Lad and is not Finzi at his most essentially idiomatic. The Introit, on the other hand, makes me lament the ruthless decision to drop the flanking movements which made up the Finzi violin concerto. I wonder if the work can ever be reconstructed? As it is the Introit is every bit the equal of Eclogue (a piece well exposed on British Classic FM). It is a work of the most haunting and evanescent intensity, heartbreaking in that passage in which the violin plays in its highest register. It is in some ways a scion of Vaughan Williams' Lark Ascending and is every bit the equal of that work. Lesley Hatfield plays it with poise, security and serenity. Again I marginally prefer the Boult Rodney Friend Lyrita LP but only because of the bigger sound of the LPO string band. The Romance is another of Finzi's heart-easing gems and in its dancing lilt can be compared to another composer whose inspiration was the human voice, the Swiss Othmar Schoeck in his Sommernacht for string orchestra. Hickox's recording on EMI is comparably fine. Overall Howard Griffiths (who has previously recorded Schoeck's violin concerto for Novalis) and his orchestra produce a faithful and fine sound in close sympathy with Finzi's restrained passion and cool ardour. I suppose another short orchestral piece could have been accommodated but this nevertheless remains a fulsome offering. Good notes by the ubiquitous Keith Anderson. Fine sound. Good (and better) performances. Bargain price. Recommended to Finzians new and potential.